QUESTION: Marty; I attended the Berlin Conference where the …. central bank attended. You said that a closing above 8100 in the DAX would result in the index breaking the 10,000 level in 2014 and perhaps reach 11,400-12,000 by 2015. Well, congratulations. You got another one right. Are we headed into that high now for next year? ANSWER: So far, it appears to be on track. The skepticism in the US about the US share market is still very high. This warns we are nowhere near the final highs yet. The DAX, though, will have a 13 year high from the lowest annual closing in 2002 and 12 years up from the 2003 low. The middle ground resistance was 9700. If that now provides support, then we can run up to test the next area in the 11400 zone. 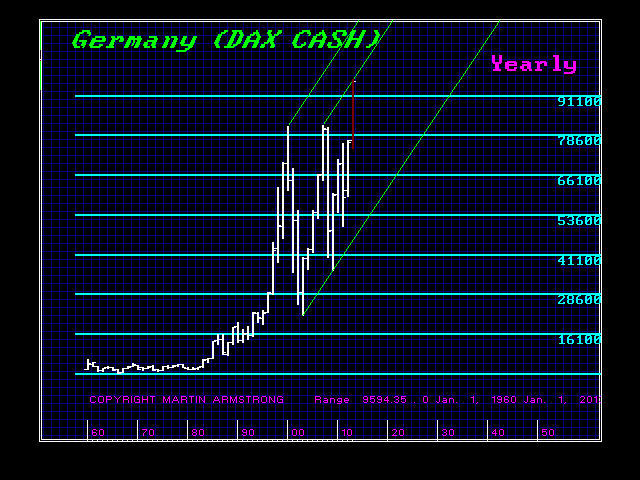 The key support lies now at the 9000 level and holding that on a monthly closing basis will keep the DAX firm. There can be a scare come September. That is where we have to target support carefully. The vast majority of analysts have been wrong because they are focused on the traditional fundamentals that do not apply in a Sovereign Debt Crisis. People are scared of what is coming where a fool and his money will be easily parted. First we have to identify the trend, then correlate the investments carefully. If the DAX were to exceed 12,000, then we are in a real Phase Transition to the upside and you better pay VERY CLOSE attention to what our computer forecasts next.